I have mentioned this before, but Fashion is often inspired by home decor. Reason being that interior design trends generally last much longer, as furniture and things to fill the home are much more expensive and require more of an investment. The way we decorate our spaces are also very telling of macro-trends of the time period, which is why fashion designers are often inspired. That being said, every once in a while I like to post home interiors that inspire me. The picture above is of a home office. If I had a home office this would probably be similar to what it would look like. 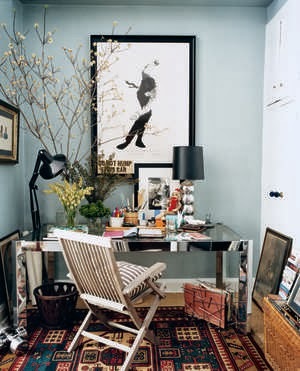 I love the desk and the way that the art is hung. The small tree on the desk is also a fun addition, although if it were on my desk, it would have to be fake as (sadly) I don't have very much of a green thumb.